Subtle variations in sperm-whale calls suggest that individuals announce themselves with discrete personal identifier. To put it another way, they might have names. Rendell and his collaborators, including biologists Hal Whitehead, Shane Gero and Tyler Schulz, have for years studied the click sequences, or codas, used by sperm whales to communicate across miles of deep ocean. In a study published last June in Marine Mammal Sciences, they described a sound-analysis technique that linked recorded codas to individual members of a whale family living in the Caribbean. In that study, they focused on a coda made only by Caribbean sperm whales. It appears to signify group membership. In the latest study, published Feb. 10 in Animal Behavior, they analyzed a coda made by sperm whales around the world. Called 5R, it’s composed of five consecutive clicks, and superficially appears to be identical in each whale. Analyzed closely, however, variations in click timing emerge. Each of the researchers’ whales had its own personal 5R riff. The differences were significant. The sonic variations that were used to distinguish between individuals in the earlier study depended on a listener’s physical relationship to the caller: “If you record the animal from the side, you get a different structure than dead ahead or behind,” said Rendell. But these 5R variations held true regardless of listener position. 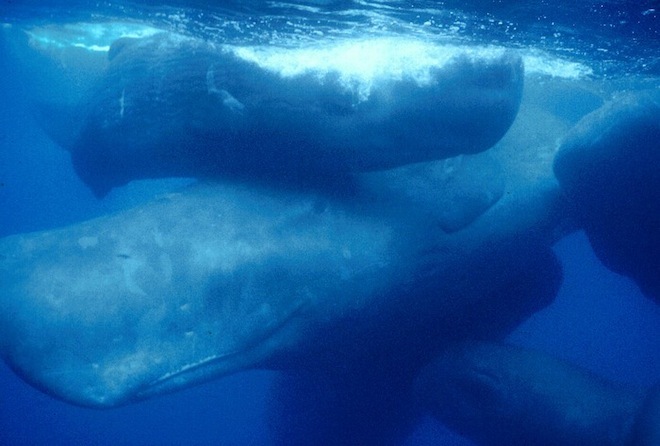 Audio: From a 2008 study of overlapping codas in pairs of sperm whales. One animal produces 1+1+3, the apparent group-level identifier. Both then produce overlapping 4R codas. After that, the first whale continues with 4R, while the other switches to 1+1+3. Finally, both make 1+1+3. The full meaning of such exchanges remains unclear, but they appear to reinforce social bonding. That individual whales would have means of identifying themselves does, however, make sense. Dolphins have already been shown to have individual, identifying whistles. Like them, sperm whales are highly social animals who maintain complex relationships over long distances, coordinating hunts and cooperating to raise one another’s calves. Sperm-whale coda repertoires can contain dozens of different calls, which vary in use among families and regions, as do patterns of behavior. At a neurological level, their brains display many of the features associated in humans with sophisticated cognition. Many researchers think that sperm whales and other cetacean species should be considered “non-human persons,” comparable at least to chimpanzees and other great apes. Compared to primates, however, studying the behaviors and relationships of whales is extremely difficult. They don’t take well to aquariums, and observations in the wild take place on their aquatic terms. Image: NOAA. Audio: Luke Rendell. Citation: “Individually distinctive acoustic features in sperm whale codas.” By Ricardo Antunes, Tyler Schulz, Shane Gero, Hal Whitehead, Jonathan Gordon, Luke Rendell. Animal Behavior, Feb. 10, 2011. The world at large is infatuated by micro-economies. You see it in fashion, in the ‘Web 2.0′ startup world of Silicon Valley and in the MASSIVE yet tiny film production world in Los Angeles. The industries of world business have always been followed by a tide, so to speak, of smaller sub groups. These groups contain their own eco systems of big and small ‘fish’ who provide food for (or feed on) each other to grow, evolve and survive. The online design and creative community is no different. It has its own cultural and financial ecosystems which are even made of several micro groups within themselves. The consumers of Envato’s marketplaces, the attendees at Carsonified events, Behance’s network, Smashing Magazines readership, Buy-Sell Ad’s advertising and Sitepoints Products are all members of different overlapping groups of a vibrant micro-economy. But even for the ‘sharks’ of these micro-economic oceans, it can be a helpful to gain some perspective every now and then by swimming past a whale. Versace, Gucci, Marc Jacobs and the other ‘whales’ in fashion, set the direction year after year for each season’s fashions. Similarly, the creative world as a whole, moves with waves made by the industry giants. From the mediums you might offer a client (Web, Print, Mobile Apps) or the essential positioning of the latest design style (can anyone say ‘letterpress’), all the way down to where the expected place for a ‘contact us’ link will go. One only has to look at the similarity in campaigns each year at the ‘Webby Awards’ or watch the commercials on TV, Hulu or passing by you on the side of a bus, to see the influence these creative ‘whales’ have on our day to day lives and ultimately our professions. Notable clients: Bel, Deutsche Telekom/T-Mobile, Diageo/Guinness, Emirates Airline, General Mills, Mead Johnson, Novartis, Procter & Gamble, Sony Ericsson, Toyota/Lexus, Visa Europe. Notable clients: Avis Europe, Continental Airlines, Deutsche Lufthansa, Dollar Thrifty, Lands’ End, LEGO, Men’s Wearhouse, PayPal, Qantas, Southwest Airlines, StubHub, and UnitedHealthcare. A quick disclaimer… although many of the companies listed have their roots in Advertising and may be considered ‘traditional advertising companies’, the emergence of web media has blurred the lines of traditional media, so much so, that there are fine lines and nuanced differences between Advertising, Media production, Design & Marketing companies/firms. Most of these listed do all of the above. 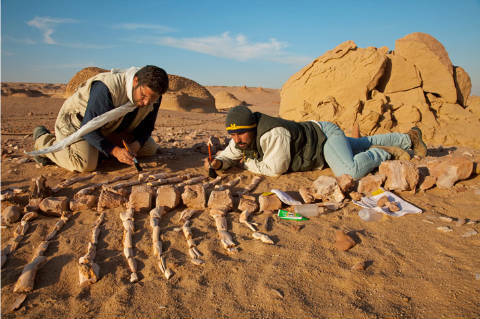 Paleontologist Philip Gingerich looks for sea monsters in the Egyptian desert. He assembles fossils of ancient whales that died there when it was covered by an ocean. One such whale is the Basilosaurus, which had small hind legs. Wadi Hitan—literally “valley of whales”—has proved phenomenally rich in such Rosetta stones. Over the past 27 years Gingerich and his colleagues have located the remains of more than a thousand whales here, and countless more are left to be discovered.